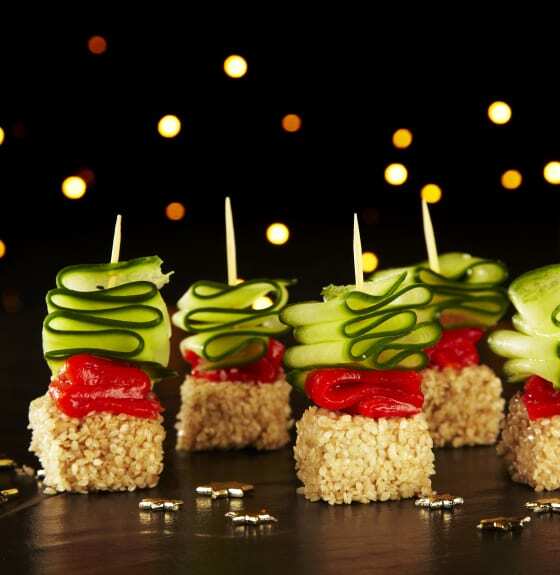 Refreshing mouthfuls of hoisin marinated cubes of Cauldron Organic Tofu, with a crunchy sesame coating which contrasts nicely with the cooling cucumber ribbons and a slice of roasted pepper. Mix the hoisin, olive oil, salt and black pepper in a bowl. Coat the tofu, covering well. Refrigerate for 30 minutes. Spread the sesame seeds on a small plate. Roll the marinated tofu cubes in the seeds then place on a baking sheet and cook for 15 minutes. Allow to cool. Fold a cucumber ribbon into an S shape and skew onto a cocktail stick. Follow with a slice of red pepper and finish with a piece of tofu. Combine the ingredients for the dip in a bowl. 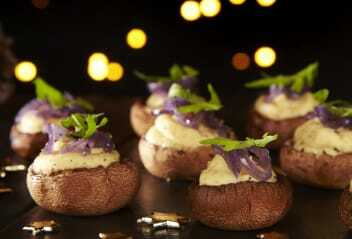 These little mouthfuls of joy have a rich, sweet, honey roasted parsnip and organic tofu filling and are topped with a sliver of caramelised onion and peppery rocket.